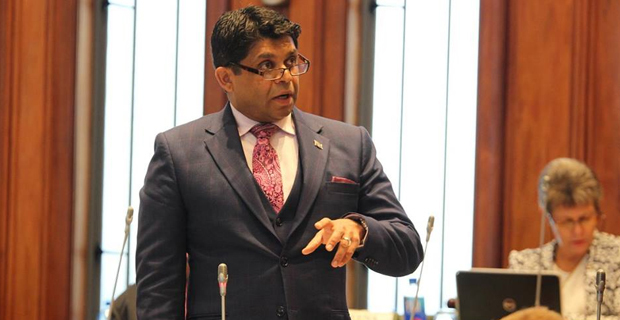 As the confirmation has come through that the government will present the 2018/2019 National Budget on the 22nd of June, Acting Prime Minister Aiyaz Sayed-Khaiyum has made it clear that the government feels that the voices of the young people is important feedback when they prepare the budget compared to the opposition’s view on this issue. Sayed-Khaiyum stressed this point after SODELPA MP, Niko Nawaikula said that the budget consultations at the schools around the country is a vote buying exercise. Sayed-Khaiyum says a number of submissions made by the students have been incorporated in the 2017/2018 National Budget. He also says that it is also important for students to know the facts as opposed to simply relying on chit chat on social media. SODELPA MP, Salote Radrodro then raised the question on what Sayed-Khaiyum will budget for rural schools who need electricity and computers. National Federation Party MP, Prem Singh then raised the issue on why teachers are left out during question time in the consultations in schools. Sayed-Khaiyum says the government wants students to be able to freely express their views. He says at one of the universities at Laucala Bay, the lecturers stayed on in the consultations and they were the first ones to ask questions. Sayed-Khaiyum says at FNU Samabula, the students did not want the lecturers to stay. He says some of the issues were precisely about the lecturers and lecture theatres. Sayed-Khaiyum says the teachers had the opportunity to go for the public consultations on the National Budget. He says in the school and university consultations, any student can ask any question. Sayed-Khaiyum then raised serious concern when he heard SODELPA MP, Semesa Karavaki say that lecture rooms and the quality of lecturers has got nothing to do with the budget. The Acting Prime Minister says FNU is entirely funded by the Fijian government to the tune of 56 million dollars, and issues about lecture rooms and calibre of the lecturers is directly related to the budget. Sayed-Khaiyum says the feedbacks are so important as he highlighted a secondary school student’s concern about teachers wanting their assignments to be hand-written although they have access to computers.